Thread: ConceptartCohesion #001: 8th Day >>> EOW VidaNova Corporation - Voting! 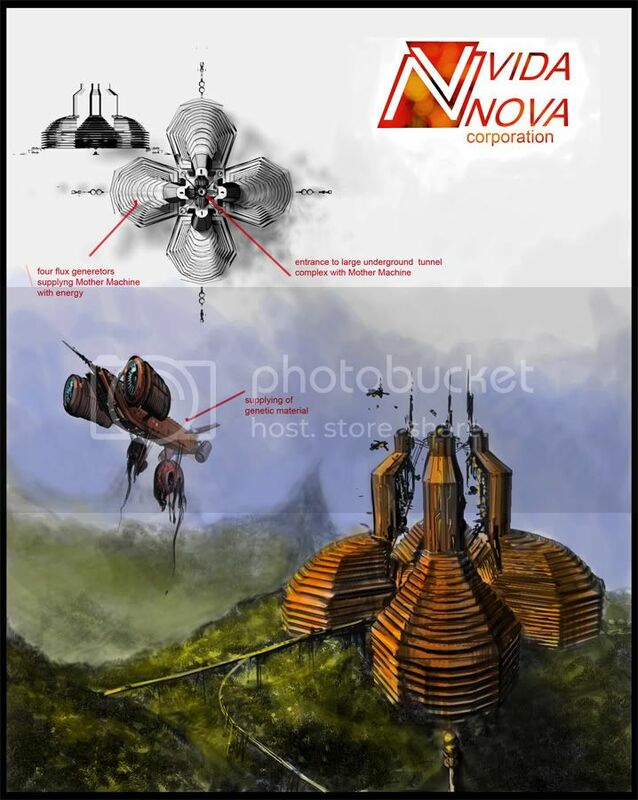 Somewhere along latitude 14&#176; South, this large isolated facility of the VidaNova Corporation Houses several small but vital research, development and construction departments. Intelligence suggests they have recently made large strides in the fields of tissue synthesis and behavioral adjustment of their products. Visual reports describe massive, and entirely self sufficient architecture, housing at least three hundred employees including support personnel, Vehicles, holding pens and the suggestion of a large underground tunnel complex. this large four building complex has large water gathering funnels on the roofs, which due to the heavy rainfall at this tropical latitude not only collects all the water needed for the facility but provides hydroelectric power through a series of cascading generators. 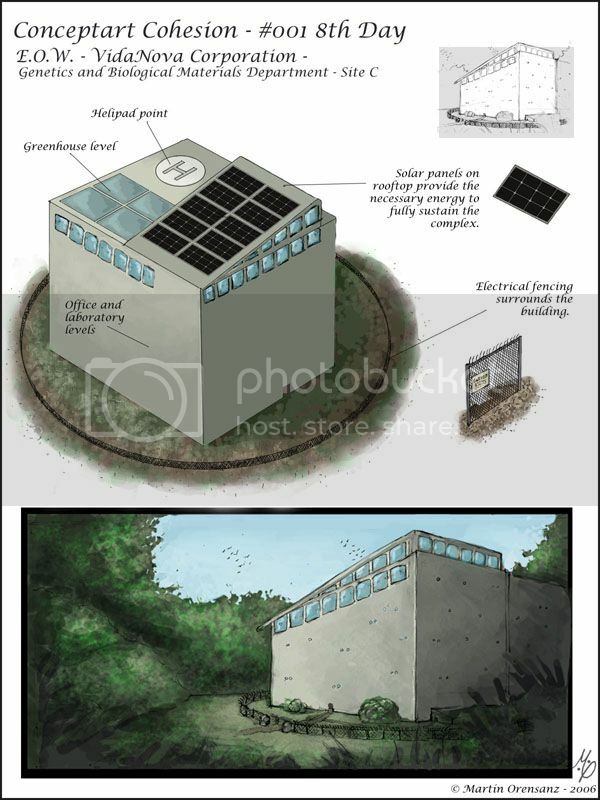 The builings are solar heated and water cooled and nearly entirely made of Glasstex a clear, impervious substrate. 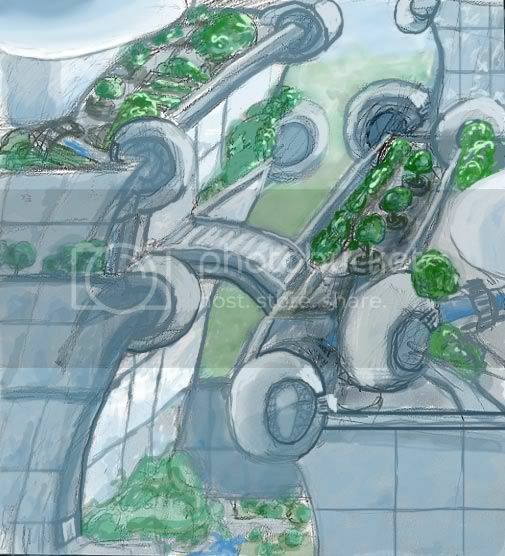 The doctors and staff of this facilty have found that their genetic creations flourish and survive much better in a semi-natural environment, so the entire upper survfaces of the buildings are cultivated and planted as gardens and farmed for food crops. as well as being holding pens for the experiments. concept: I think it can be a big industrial complex with a huge security wall and only one possible way to get inside - the overground autobahn. The tubes allways smoking. And local people call this complex "The CloudsMaker"
concept: VidaNova Corp. set its Genetics and Biological dept. in the Southern Peruvian Andes. There are many VidaNova scientific labs strewn across this region, but this one has a crucial role in the research and development of new "in vitro" species. Thus, it was projected with a unique defensory system that can make the entire section disappear; but to the human eye, radars and scanners only. Rook is busy as hell at the moment...i will take over EOW for now...i didn't know that the poll wasn't started yet, just saw it, sorry for the delay! okay, pretty easy choice: Laurentiu! nice entries by: Goran, digitalfly and Koshime! Voted for DigitalFly... man I wish I could paint like you (I dig your creature painting a lot). I like the mood and atmosphere, I wish you would have detailed it out more, but when I think of the iconic "large corporation that is creating genetic madness", I thought of yours. Also...Laurentiu... amazing. I love the blood flowing through it... very awesome. If I could have voted for a tie, yours would be there too. laurentiu gets my vote, without a doubt, ima little dissapointed there wernt more entries, but i see it was pretty complex. digitalfly's was a close second, but without much look at the scenery around it, i didn't really know if it fit the climate in the topic. it had more of a temperate "industrial revolution" feel. other than that, it was a great piece. Oh btw did this confuse any one but me? …”large isolated facility of the VidaNova Corporation Houses several small but vital” both large and small? Digitalfly--- beautiful pic… not sure it’s of the description I read. Seems awfully industrial and bleak.. How can one tamper with life forces when there’s no life around? Also no indication of climate or latitude..Although that could probably be changed by the amount of industry evident.. this feels like a Faerie Birmingham. And as such is striking. But um this looks a lot like my heat pump. It is implied by the connected assignments that the critters can escape and it says that people live here. I wouldn’t want to, to be honest. Self-sufficiency needs water air and energy… of course all those things might be there but it is solo box like especially if that’s a door and the scale is really that huge. Excellent futuristic ness and very evocative rendering…. have you ever been in a Lab? They tend to be white and clean and bright to the point of sterility…I can’t see it. Submitted with great respect and honour for you all..well except me. LOL Chaos. I actually thoght yours was pretty good this time around. It's some of the best stuff I've seen you post. Goran's fit the bill nicely. I agree that Laurentiae's is the most impressive but it doesn't seem to have all that much to do with the description. Chaosrocks: i think you're definitely making improvement. Yes the perspective's wonky, but it's an interesting angle. My vote went to Goran, I was completly blown away by the image and the design. I'm very thanx for voiting for me and so sorry for unfinished my EOW!!! All last week I was traying to finish it but have not time... Very sorry. Laurentiu_Bontea got my vote. Nice layout, great enviroment. Goran, yours is well done and I like the other stuff goin on. busy little peep this week eh? Laurentiu_Bontea gets my vote. Runner up were digitalfly. Nicely put down, wonderful for the eyes at the same time it's a good concept. I'd love to see more of it though, the part we see tickles my fancy. I voted for goran. The design had a kind of organic and tech feel to it. It reminded me of a bee hive with the shape and the ships flying in with new matteral. kudos for giving your full attention and help in the activities and making sure everything and everyone are taken care of. thx man....i am glad you brought your toys back...there was a bigger and stronger guy in the sandbox you played eh? nope. just got seriously bored. screwd and with no logic, and i was totally right. really bad or boring or amateurish pieces (and some are just really into ants apparently...) gets tons of votes while great entries are bluntly ignored. usually beacuse of who`s NAME is signed on the creation, rather than the creation itself. some sort of a work frame. i`m gonna post entries in the weeklies when possible, but i`m not gonna vote or take any part of the discussions or inner politics and ball-licking (pardon my french). BUT the important thing is that the ones who participate or judge by the concept and image quality have the chance to steer things in the right way..
How can things change when the ones who actually want changes are stopping?